As the decriminalization of marijuana moves from state to state, Prohibition, the prior American effort to outlaw substances people use for fun and stupor, is having a cultural moment. But the ban on alcohol 96 years ago last month can also provide lessons to those trying to reduce the use of a substance probably more globally harmful than weed: oil. Those impatient with the pace of change in the energy and environment sectors, for instance, can take heart from the fact that Prohibition seemed impossible only a handful of years before it passed—and in a more comprehensive form than its supporters expected. 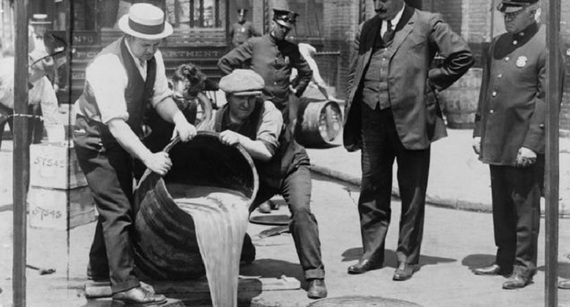 Prohibition's swift adoption came in part from unrelated causes (with four Amendments adopted in a decade, the 1910s were a period of remarkable Constitutional plasticity) and coincidence (German-American brewers were an easy target of xenophobia during World War I). These accelerated a movement slowly building from smaller victories. A Tesla driver in Cupertino tut-tutting at the Ford F-150 driver in Butte should also remember Prohibition's lessons on class. The Eighteenth Amendment was a victory of teetotalling WASPs in a culturally divided nation. But its support from a relatively narrow elite was also its undoing. As explained in The War on Alcohol, Harvard history professor Lisa McGirr's revealing new history of Prohibition, the anti-alcohol movement's snobbery, sectarianism, and hypocrisy were resented by immigrants and the working class not only because they were deprived of wine and beer but because many saw Prohibition as an attack on them. But no lesson of Prohibition is more revelatory than its central tension: was it primarily a fight against alcohol supply or alcohol demand? As McGirr recounts, the Women's Christian Temperance Union originated in evangelizing Christian movements of the 1830s and 1840s to spread self-discipline and upward mobility. But WCTU's rhetoric over time came to resemble the Anti-Saloon League, a highly disciplined younger organization with the less abstract goal of shutting down saloons. The anti-alcohol movement steadily moved away from temperance and towards opposition to the manufacture and sale of liquor. The dominance of antisaloonery was enshrined in Prohibition's laws. The Texas senator who introduced the resolution that became the Eighteenth Amendment clarified, in his own mind at least, "I am not a prohibitionist in the strict sense of the word... I am fighting the liquor traffic. I am against the saloon. I am not in any sense aiming to prevent the personal use of drink." The Volstead Act, which instituted the amendment's enforcement, didn't even criminalize the possession of liquor. People could legally drink; they just couldn't buy alcohol. In the war on oil, the fossil fuel divestment movement is the heir-apparent to the Anti-Saloon League. The divestment movement works because it has a clear enemy and is based on a simple economic proposition: the best way to reduce the use of oil is to harm the economic interests of the oil industry by making its work socially unacceptable. On the other side, last December's Paris Climate Deal can be seen as the decarbonizing heir to the anti-demand sprit of the WCTU: the final agreement aggregated voluntary national temperance commitments. Each country pledged to emit less greenhouse gases via uncoordinated plans. Echoing the Protestant work ethic, the agreement also mandated that each country report an improved plan every five years. Of course, no environmentalist organization—or individual environmentalist—is exclusively anti-supply or anti-demand. (In Prohibition, too, anti-demand impulses lived on even in an era of violent anti-supply.) Yet, in American fights against fossil fuels, we seem to be living in a period of conspicuous anti-supply, as seen in campus divestment rallies and the campaign that killed the Keystone XL pipeline. This begs the question why, considering that Prohibition, like the current war on drug supply, infamously produced side effects worse than the original disease and failed to permanently suppress alcohol demand. I suspect that anti-supply calls in the fight against climate change draw energy and support because they are unifying and morally stirring, good and necessary things for any social movement. It's an inspiring cause (and an easy one) to call out ExxonMobil as a deceptive pusher of oil consumption. It's divisive to discourage your spring breaking classmates from flying to Cancun. But the biggest difference between Prohibition and the fight against climate change is also the climate fight's biggest challenge: in the war on fossil fuels, there are no abstainers and drinkers, just complicit consumers of relative volumes, enthusiasm, and self-awareness. A war on fossil fuel demand can also be disheartening given how exhaustingly hard it will be to win, compared to successful wars on demand for, say, cigarettes or fattening foods marketed to children. As Bill Gates recently pointed out, the reduction of fossil fuel use during a period in which the world seeks to provide a growing population in developing nations with more energy will require a "miracle" and innovation at "an unnaturally high pace." The Paris Climate Deal was a triumph of international cooperation and an environmental landmark. Yet at current levels of each country's self-diagnosed temperance, the reduction in carbon emissions may not prevent the worst effects of climate change. Indeed, if the national pledges aren't abided or improved, Paris's war on demand decades from now may seem like an Alcoholics Anonymous meeting where everyone pledged to cut out tequila. But there is hope. Prohibition was doomed to fail because beer without alcohol is fizzy, cabbagey water. Energy with less carbon emissions exists, as monumental are its challenges to scale up. And so maybe a war on oil demand can be won by a war of supply—not against anything but for power supplied by that energy miracle we need. GARY SERNOVITZ is a managing director at Lime Rock, an oil- and gas-focused private equity firm. He began his career as an oil equity research analyst at Goldman Sachs. He has written two novels, Great American Plain (2001) and The Contrarians (2002), as well as essays and reviews for The New York Times, The Wall Street Journal, n +1, and Slate, among others. A native of Milwaukee, Wisconsin, he lives in New York City with his wife.